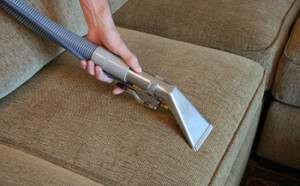 First Class Cleaner London provides top notch sofa and upholstery cleaning services in all London areas. Designed to deliver consistent and thorough service, our company’s been on the market helping people with their upholstered furniture for a long time now. Positive feedback has helped us claim our rightful place in the list with best cleaning service providers. There’s a lot more to upholstery cleaning than just applying a detergent and scrubbing helter-skelter. That’s why professional help is becoming so popular. The first we consider when we approach your furniture is the material used in its make. Indeed, synthetic fabrics are designed for ease of care, but there’s still the chance you ruin your furniture and make it impossible even for skilled hands to undo the wrong. And if your furniture is more than 50% cotton, then calling us is your best bet. Delicate fabrics require different ways of treating them. A rule of thumb is that as little as possible moisture should be involved in the cleaning process – our up-to-date tools allow us to gently rinse the surface and extract the grime from the very base of your furniture. This usually leaves the furniture almost dry, and thus shortens the time required for completely dry upholstery. We’re proud to hire experts or highly motivated people who in due course catch up with their seniors and become fully-fledge professionals in the realm of upholstery cleaning. Top-of-the-range equipment and cleaning materials are provided by some of the cleaning industry’s most prominent names. We believe that investing in top notch tools yields greater returns in terms of thousands of satisfied clients and new areas where our reputation is already known and our services are already desired, thus allowing us to expand across the country and make more people happy. We’re experienced in applying different cleaning methods to make sure we deliver the agreed-upon service in a prompt and cost-efficient manner. Whether it’s hot water extraction, dry cleaning, steam cleaning, down to the simplest stain removal, we’re there to offer you the best available way of restoring the past glory of your furniture. We offer first-rate cleans and competitive prices by way of delivering our service in bundles tailored to fit your financial qualms and lack of experience with cleaning services. Even though we are inclined to step back on prices, we always strive to deliver a high quality service. By staying close to the customers we’ve managed to become an irreplaceable part of their lives, and we now have scores of loyal clients.